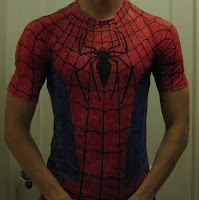 A few halloweens ago I went as Spider-Man, the Marvel Comics superhero. Rather than try to make a full body spandex suit I opted for the simpler and less awkward option of being Peter Parker ready to become Spider-Man. 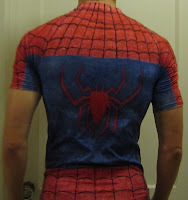 This entailed making a Spider Man shirt, and wearing it under an open button-up shirt, as if at any moment I could whip off the shirt and go fight crime. The shirt was pretty straightforward, but very time consuming. I don't know how to dye fabrics, so I decided it would be a fun idea to take a white spandex shirt (the cheapest one I could find at Marshalls) and color it with permanent markers. I colored in the red and blue first, then drew in the black spider and webbing. For the red spider, I drew the spider first, then the blue around it. 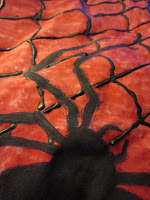 The black spider was drawn right over the red. I should note that I did this because I thought it would be a cheap and easy way to make the shirt. It was fairly simple, but incredibly time consuming and I went through many many permanent markers. To make the webbing, I marked the collar and waist with where each line would go using a ruler, then connected the dots. 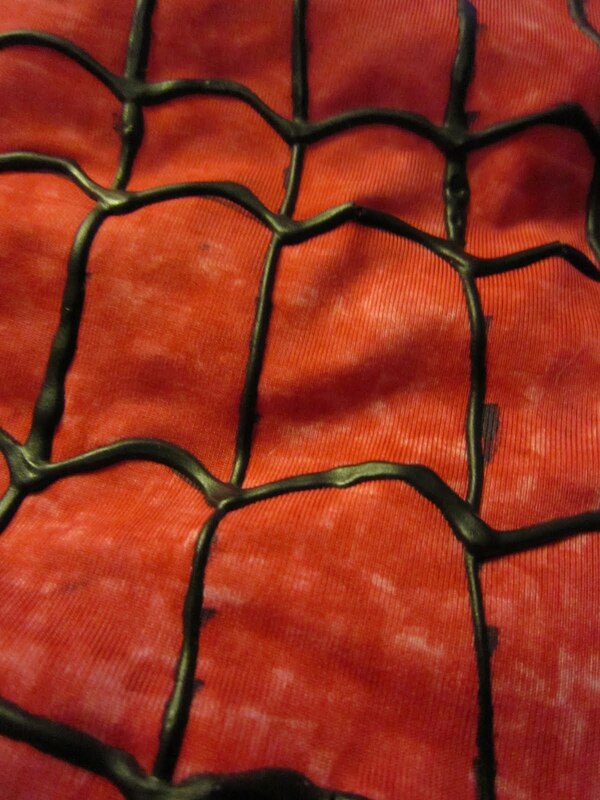 Once the webbing was drawn in with permanent marker, I traced over it with black puffy fabric paint to give it a 3D effect.